Five of Sydney's prestigious GPS schools have boycotted competition with another member of their association, The Scots College. The five accuse Scots of offering sports scholarships, in breach of the GPS code of ethics, which stipulates that 'financial assistance to talented sportsmen shall not form part of the enrolment strategy of any member school'. Scots principal Ian Lambert denies the school awards sports scholarships as such, and refused to tell Fairfax Media whether any premiership-winning basketball players were on a bursary or scholarship, citing privacy reasons. 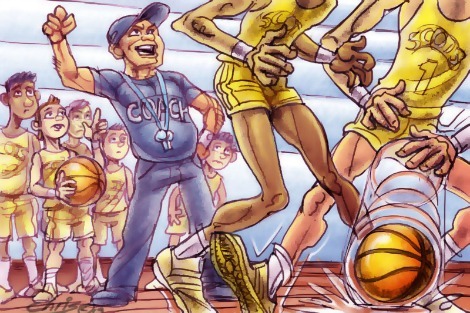 Callers to talkback radio claim the practice of recruiting gifted sports people is widespread. The head of another GPS school — Kings — admits his school has 'offered inducements to a few good sportsmen' and that 'schools have long learnt the rhetoric needed to defend the deliberate importation of gifted sportsmen'. The five GPS schools are taking their stand in an attempt to preserve the 'level playing field' that is necessary to ensure that everybody plays by the same rules and there is no external factor affecting the ability of players to compete fairly. It's about protecting amateur sport in schools from the professionalisation and commodification that has come to dominate sport in Australia and overseas. Fairfax reports that Scots has embarked upon a program of 'buying' students of sports star quality in order to promote an ethos of winning ahead of the more traditional values that encourage the participation of all students. The school is equipped with a new high-performance centre and has a dedicated director of sports science who worked with controversial Manly-Warringah Sea Eagles rugby league consultant Stephen Dank. It would seem that it has moved far beyond what the GPS code refers to as 'the spirit of the amateur' that 'should remain the ideal'. If teenagers with sporting talent are being 'bought' for the purpose of boosting the school's brand and business, it has to be seen as an exercise in human trafficking. Arguably pressure is being placed on these minors to produce a marketable commodity, and that's child exploitation. It's an an altogether different activity to 'playing' a 'game', which is what school sport has traditionally been about. Amateur sport stresses participation and promotes the development of character, resilience and teamwork ahead of winning. It is opposed to the commodification of sport that is associated with the cultivation of an elite of highly paid athletes equipped to perform at a high level. Many would-be amateur sports people are not up to the standard of the professionals and are relegated to a passive spectator role in front of a TV screen. That's not what schools are educating students for. From the sublime (Don Bradman, for sheer enjoyment, using a cricket stump as a bat hitting a golf ball against a brick wall) to the ridiculous (disrespecting young people in hope of attaining sporting glory). My husband and I who have both worked in the independent schools sector fell about laughing at the contention that buying talent for GPS schools is news. That they have a code of ethics regarding this is also a source of humour as this code obviously is never ever adhered to by any of the GPS schools nor by any of the more elite independent schools. Bring on public education! I cannot imagine anything more opposed to gospel values than the worldly seeking of sporting prestige that preoccupies many Catholic schools. This is as obvious here in Brisbane as it is in Sydney. Education is not what many schools or universities are about these days. A number of unis have remedial English and reading classes! At last this deceit has become evident to all and highlights the huge discrepancy in the funding of state and "independent"schools. The holier than thou action taken by the likes of Mr Hawkes and his lot in "boycotting" the GPS basket ball competition demands closer scrutiny. This is STRIKE action Mr Hawkes, a strategy you deplore in your scheme of education. Judge a school's values not by what their prospectus says but by what they do with taxpayers' money. Of course Joeys at Hunters Hill have always had sporting scholarships. On a related topic, what about money spent on marketing schools? Scholarships may have some benefits for students in need, if the need can be proved, but every penny spent on marketing any sort of school should be deducted from government funding. Sometimes you need to look at things from both sides. My son received a half scholarship for 5 years at a GPS Catholic school for his sport. As a single mum I could not have afforded the full fees. He has had a wonderful education and made friends for life. It goes both ways and to me is an extremely Christian thing to do. This is not new and it is unfair to single out one school. Many private and public schools do this and have done for a long time. However, it is definitely unfair. Not only to those who aren't in the know, but to those schools without large funds behind them. Not to mention the girls schools who are still playing catch up with the wealthy male schools because of discrimination and sexism. The practice at GPS of obtaining or retaining grade A athletic students by scholarship or other commercial means is both widespread and of long standing. I can recall student extensions and university guarantees being offered to top performers in the 1960s at both Joeys and Kings to students who subsequently did not leave their respective high schools until they were in their 20s. As far as obtaining positive sports outcomes results for the colleges concerned; it worked.